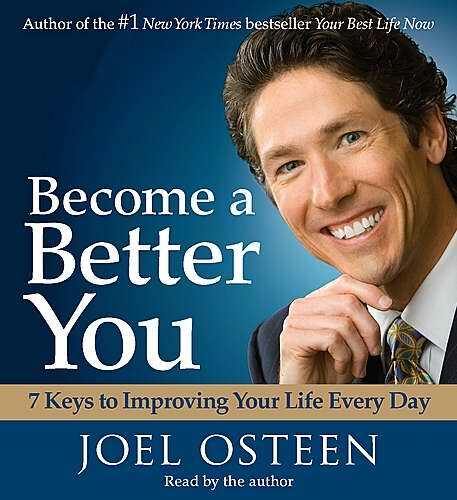 Joel Osteen is back with his new audiobook CD, 'Becoming a Better You.' The audiobook advises audiences to study their own soul and spirit so that they can discover their real character and personality. Subsequently, Osteen discusses the theory that that we were not created by God to become mediocre - instead, the Lord demands us to push ourselves and develop both our character and existence. The author continues to encourage spiritual growth by stating that we have been given everything we need to develop - but it is up to us to use these assets. 7 key principles are revealed which are designed to improve your life every day. This audio book is read by the author, Joel Osteen. It is an abridged CD, containing 5 discs. Become A Better You Audio CD by Joel Osteen was published by Simon & Schuster in October 2007 and is our 17974th best seller. The ISBN for Become A Better You Audio CD is 9780743569422. Be the first to review Become A Better You Audio CD! Got a question? No problem! Just click here to ask us about Become A Better You Audio CD.